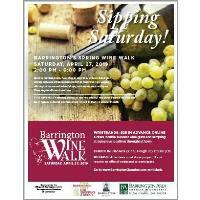 The Spring Barrington Wine Walk, sponsored by The Barrington Area Chamber of Commerce and the Village of Barrington, will take place on Saturday, April 27 from 2:00 – 6:00 p.m. Attendees are invited to enjoy a “Sipping Saturday” while visiting many unique stores in downtown Barrington and enjoying great wine provided by 25 participating merchants in the downtown Barrington area. Check-in begins at 2:00 p.m. at NeoTeca, Inc. 130 S. Hough St. in Barrington. Tickets are $25 and can be purchased in advance online at www.barringtonchamber.com. Ticket price includes: access to a 1-oz. pour at each merchant location, souvenir wine glass, a map of the wine-tasting locations, and a list to check off each tasting sample. A trolley will be provided to transport Wine Walk attendees to designated stops throughout the downtown Barrington area. Attendees must be over 21 years of age or over to participate and present identification in order to receive a wristband. Wine Walk participants can also enjoy French-themed specials and products at several Barrington retailers and restaurants as part of the “April in Paris” event sponsored by Barrington Cultural Commission. Barrington merchants participating in the Spring Wine Walk are: Anderson's Candy Shop, Angelina, Barrington Flower Shop, Big Iron Horse BBQ, Colored Squid, Estate Jewelers LTD, Fancy Art, N.F.P., Flesk Brewing Co., Fleur De Lis Salon, Heinen's Grocery Store, Jewel-Osco, Long & Co. Jewelers, McGonigal's Pub, MS Moda Bridal Salon, Natural Serenity, Notice, One Girl, Paris Market Antiques, Savvy Spirit Women's Clothing and Accessories, Shakou Barrington, Skin Wellness by Renee, Studio 4 Hair Salon, Trevor James Salon, Verbic Orthodontics, and Vin Chicago.